Why is My HVAC Unit Making That Sound? This time of year is probably the most demanding on your outdoor HVAC unit. In order to keep your home cool, this unit is likely working all day to cycle air through your living environment. This workload not only uses a good amount of energy, but also can take its toll on the functionality of your unit. Like any machine, your HVAC unit wears with use, and this can cause it to function inefficiently. In fact, if left undetected, this wear can shorten the lifespan of your unit, forcing you to purchase a new one when you least expect it! There is good news, however, as there are warning signs you can detect early to minimize the amount of wear your unit receives. Some of these warnings include an increased electrical bill and poor cooling performance, but perhaps the most telling warning signs are the sounds your unit may be making. If your machine is banging, chirping, or rattling you may be able to diagnose the problem and possibly fix the issue yourself. By taking advantage of these warnings, you can have your unit repaired and prolong the lifespan of your equipment. If something is wrong with your unit, one of the most common sounds you may hear is a loud banging noise. This can range from a softer clicking to the sound of shoes in a clothes dryer. This sound is most likely to be produced by the fan in your unit, or the shaft rotating it. If you are hearing this sound, it is possible for you to resolve the issue yourself! First, be sure to shut the unit off as soon as possible to keep the unit from damaging itself. Then, check the top of your unit for debris. There could be leaves, branches or other objects obstructing the fan from turning. If the fan area is clear, then you may want to look inside of your unit. A likely issue is the shaft under the fan. If the shaft appears to be loose, you may be able to tighten it, but it is probably best to call an HVAC technician. Another issue may be that the shaft itself is broken from use, in which case a replacement part will be required. Another common sound a unit may produce is a squeeling or chirping noise. This noise is usually a sign that two parts are rubbing together without proper lubrication. If the sound is more of a chirping (short, high-pitched, but not ear-splitting) then the best way to diagnose the issue is to simply wait a few minutes and see what happens. If the sound goes away, then the issue is likely minor. In this case, note that the sound has happened and tell an HVAC technician the next time your unit is examined. If the sound does not go away and/or is more of a squeeling, then the issue is likely more serious. 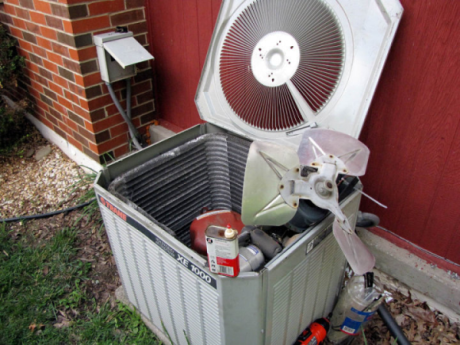 This sound is often produced when an outdoor fan or condenser is being affected and is in danger of breaking. You should turn off your unit and then call a technician to examine your unit to prevent damage. Vibration and rattling noise is another problem that is often caused by the fan, but this is not always the case. Most HVAC units use isolation padding to absorb the motion noise produced by the internal parts. These pads can also wear over time and even begin to crumble and break, increasing the noise level of your unit. Another possible cause of this sound can be refrigerant lines that are installed too tightly. In this case, a technician can easily adjust the unit to resolve the issue. Simply listening to your HVAC unit can prevent surprise damages and surprise expenses. Warner Service wants you to know that especially in the summer heat, if you suspect that something is wrong with your HVAC unit, it is better to be safe than sorry. Call a certified HVAC technician to examine your unit to make sure your home stays cool and comfortable this summer!